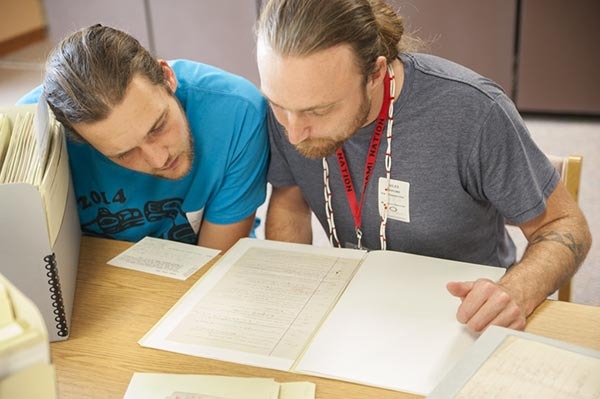 The Myaamia Center at Miami University has been awarded a $182,406 grant by the National Science Foundation (NSF) for the “National Breath of Life Archival Institute for Indigenous Languages” project. The funding is part of the Documenting Endangered Languages program, a joint effort between the NSF and the National Endowment for the Humanities (NEH), which is designed to support projects that protect and preserve endangered languages. This is the second time the Myaamia Center has received NSF funding for the project. Breath of Life is designed to train researchers from indigenous communities in the methods of archives-based linguistic and ethnographic research. This research is critical to the advancement of knowledge about indigenous languages and cultures and to their revitalization. Daryl Baldwin, director of the Myaamia Center, is principal investigator. Co-principal investigators are Leanne Hinton, professor emerita of linguistics at the University of California at Berkeley, and Gabriela Pérez Báez, curator of linguistics and director of the Recovering Voices initiative, National Museum of Natural History, Smithsonian Institution. The Native American Languages Act, passed by the U.S. Congress in 1990, enacted into policy the recognition of the unique status and importance of Native American languages. All Native American languages are endangered, and more than 120 of them have gone silent, which means there are no remaining fluent first language speakers. Experts recognize approximately 7,000 languages worldwide and estimate at least half will fall silent by the end of this century, according to the researchers. National Breath of Life (BoL), as the program is more widely known, was awarded a $167,650 grant in 2014. The increased funding for this year’s award is largely due to a new assessment component that will be directed by Miami University’s Discovery Center for Evaluation, Research, and Professional Learning. ”The results of the assessment will inform the evolution of the institute to ensure that the National Breath of Life continues to offer state-of-the-art training in linguistics and archival research for community researchers,” Pérez Báez said. Co-hosted by the Smithsonian’s National Anthropological Archives, the National Museum of the American Indian and the Library of Congress, the 2017 National BoL workshop will run from May 29 to June 9 and introduce linguistics and the language sciences. Participants are grouped by their heritage language, with each group assigned an academically trained linguist for one-on-one mentoring in the analysis of archival materials in that language. Ultimately, these efforts by citizen scientists will increase their linguistic understanding of their languages to support reclamation and further investigation of the languages. The National BoL will train citizen scientists from some 15 language communities, bringing the cumulative number of languages investigated in these national workshops to more than 70. The Breath of Life archival model has been successful in engaging Native American citizen scientists to work with archival language documentation in repositories in California, Oklahoma and Washington, D.C.
“Thanks to the support of the NSF-DEL program and our partnerships with the Smithsonian’s Recovering Voices and the National Breath of Life Committee, we are able to offer this unique opportunity for selected participants to research new archival resources and receive specialized training that supports their community’s language research needs,” Baldwin said. Originally appeared as a “Top Story” on Miami University’s News and Events website. Photo of Daryl Baldwin by Ricardo Trevino, Miami University Photo Services. Tututni language team photo courtesy of Myaamia Center archives. This entry was posted in Research stories and tagged American Indian, language, Miami Tribe, myaamia, Native American, neh, nsf. Bookmark the permalink.